As hypnotherapists, we see people with a range of problems. However, feelings of loneliness can trigger a 'protective instinct' within us. We may feel that we want to 'reach out' and offer friendship to them - however our professional code of ethics means that we shouldn't overstep that boundary. It is important to remember the possible consequences that feelings of loneliness can result in - i.e. depression, self-abuse, withdrawal - even suicide - which is why it is essential that we do our very best to help clients who are experiencing loneliness. 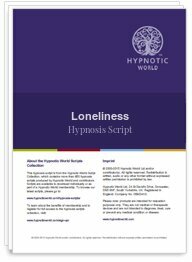 This hypnosis script download from Hypnotic World can help you to help your clients - in a therapeutic setting - to overcome their feelings of loneliness and turn their life into one of joy and sharing.